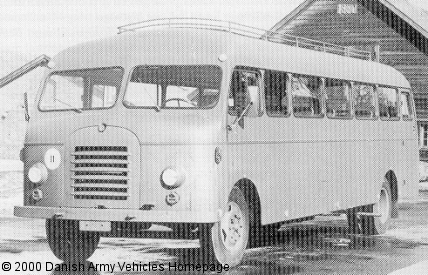 Danish Army Specific: Introduced in the late 1950´s at a price around 34.000,- Kr ea.. Danish body-work by Ringsted Karosserifabrik (Ringsted Coach Factory) on SB-chassis. Late production models had US military pattern black out lights, front and rear. All had a second door on the left-hand side at the rear and a large roof luggage grid. Historical: The SB-chassis, known as the "Big Bedford" was introduced in October 1950. It became a major success and remained in production until 1986. A new version with longer wheel base was announced in August 1955. Besides bus-production the chassis was used in other applications where roomy body-work was required, like mobile libraries. The chassis was used to produce a dual-purpose coach/ambulance operated by the British Army and RAF. These vehicles were generally constructed by Strachans. Length: 8.65 m (337 inches). Width: 2.40 m (93 inches). Height: 2.98 m (116 inches). Weight: 9.075 kg (40.500 lb.). Engine: Own 5.410 cm3 (330 cubic inches) displacement, liquid cooled. Horsepower: 103 at 2.600 rpm. Variants: Bedford SB (1970´s version).